Find out more about the 11+ maths exam and how Bond 11+ maths resources can support your child on their path to exam success. 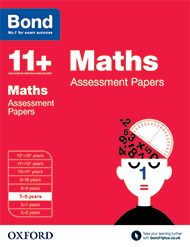 11+ maths tests cover a broad spectrum of maths principles and concepts. They examine how effectively a child can understand and manipulate numbers. 11+ maths exam papers are timed and usually last between 45-60 minutes. Children should practise with timed 11+ mock test papers, as well as working through non-timed practice, so they can see what they are able to do within a given time frame. The essential manual for all parents whose children are about to embark on their 11+ exam journey. Written by an experienced 11+ tutor, this guide offers a practical 4-step approach to guide you through the entire process. Here are some ideas for you to try at home in order to help your child prepare for their 11+ maths exam. Establishing a regular routine of practising times tables. Introduce a couple of quiet, uninterrupted sessions a week for practice. Practising maths skills little and often, with an emphasis on quick thinking and rapid feedback. In 11+ maths, children are expected to show dexterity in manipulating numbers and the ability to solve problems of all kinds logically. Focusing on areas of difficulty, consolidating skills and developing time management skills. Your child should be covering all aspects of maths that he or she will need for the 11+ exam at school so focus on these three additional areas at home.